We have a couple of blueberry bushes at our house. 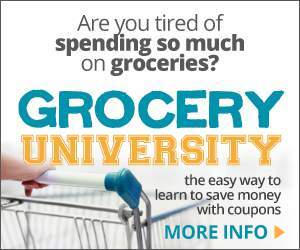 They don’t supply us with much more than berries to eat fresh. 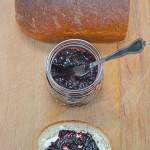 But occasionally, I will get some blueberries from our neighbors or I’ll find a great deal at the store, when I do I make this easy to make blueberry jam. Now I don’t know if I would even call it a recipe. Since it just takes a few ingredients to make. If you can boil water you can make this jam. I usually just make a big enough batch to eat fresh, since I keep the sugar fairly low in this recipe. One word of warning though, when making this jam be sure to wear a shirt you don’t mind getting a stain on. Or put on an apron. It never fails when I go to smash the berries they will squirt at me. Ending up on my shirt or the floor. I have used frozen berries to make this jam and it turns out really nice. If you use fresh blueberries you might need to cook them a little longer to get them to gel. To make the jam I place some berries into a saucepan. I add a little water, just enough to keep them from burning and the sugar. Then I simmer the berries to start to break them down a bit. Since I’m not canning or freezing the jam I keep the sugar fairly low. Just enough to sweeten the jam. After about 5 minutes of simmering, I will remove the pan from the stove and mash the berries with a potato masher. Be careful, the liquid is hot and the berries like to squirt. After the berries are mashed, return to the stove. Continue to cook and stir until the jam gels. 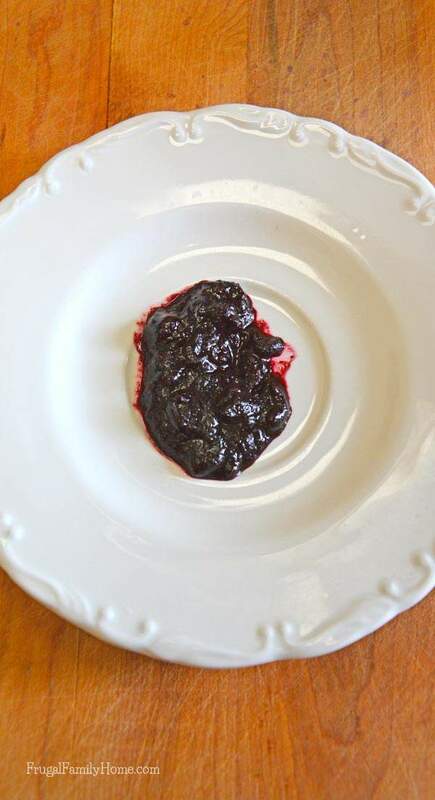 You can test the gelling of the jam by placing a teaspoon of jam on a chilled plate. Then place the plate in the freezer for a few minutes. Test the jam to make sure it’s not runny, if it is set then the jam is done. I store my jam in a glass jelly jar with a lid in the refrigerator. I’m not sure how long it will keep, probably about two weeks. This jam just doesn’t last that long at our house, it gets eaten up too fast. 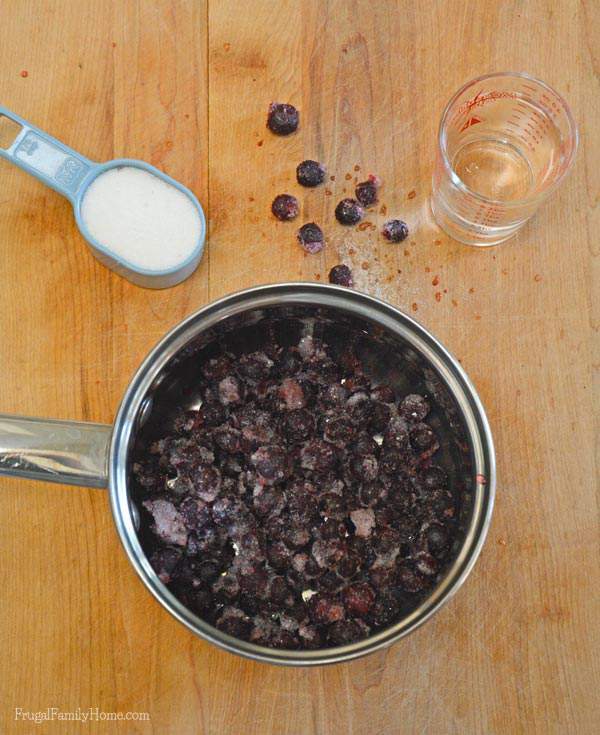 Place the blueberries, sugar and water in a pan and stir to mix well. Heat the blueberry mixture over medium high heat to a simmer. Then let simmer over low to medium low for 5 minutes. 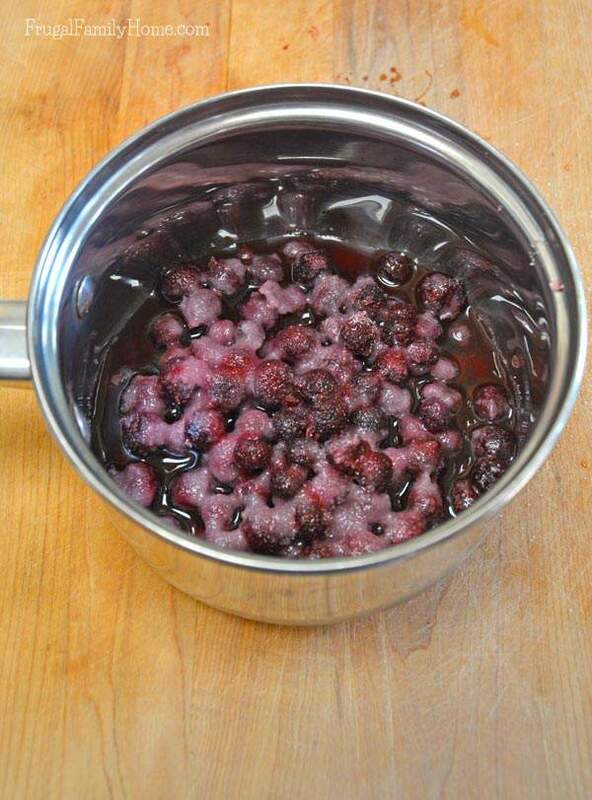 After simmering for 5 minutes, crush the berries with a potato masher. You want to have chunks of blueberries so don't puree. Then simmer on medium to low heat, stirring constantly until the jam jells. To test the jell, place a small amount of jam on a chilled plate and place in the freezer for a few minutes. 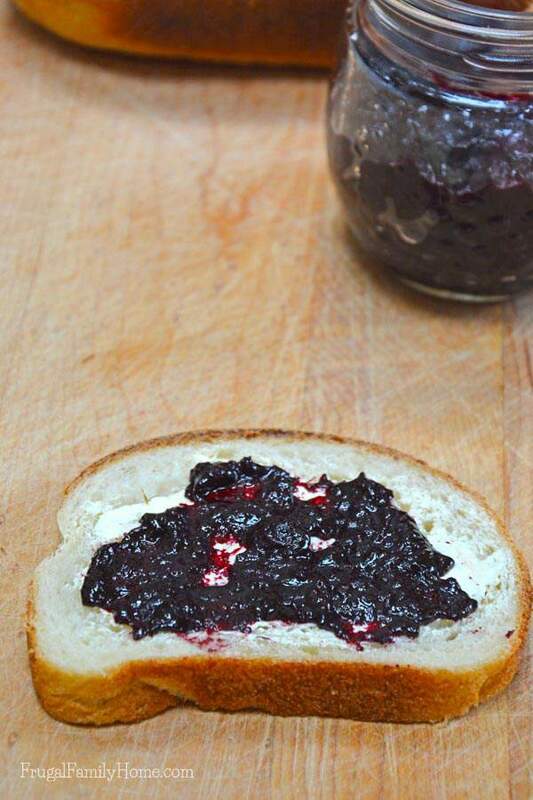 If the jam is no longer runny it's ready. 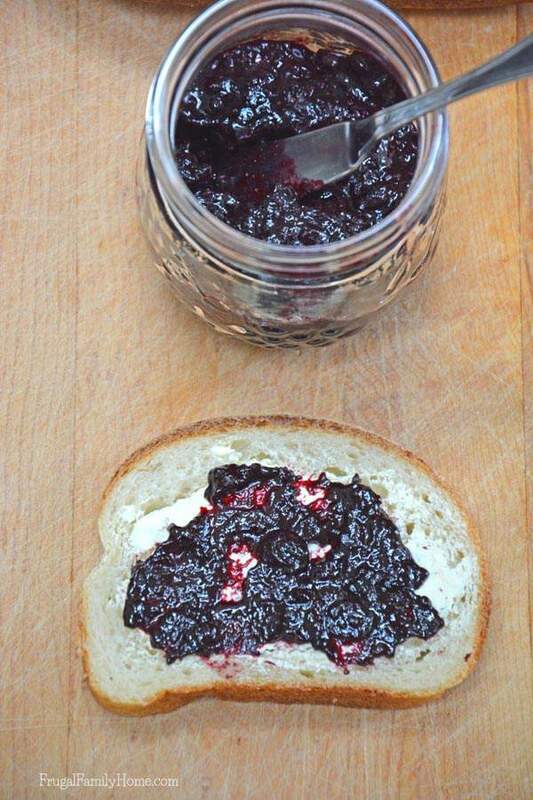 Place the jam in a clean jar and store in the refrigerator. What’s your favorite jam? And do you make it yourself? 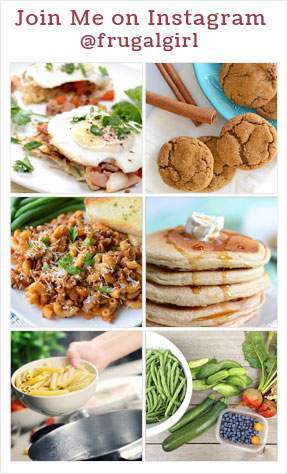 This looks yummy. 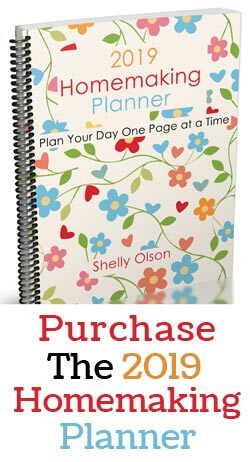 I will have to try it should our blueberry bush grow enough fruit. I have pinned this, so I can try this. It looks yummy! I love blueberries. Thanks for sharing! Stopping by from Thrifting Thursday link up. You TANTALIZER! I am going to have to make this right now. Oh, and one question… the recipe says “Servings: 4 ounces.” May we assume that the 4 ounces is the total yield from the 2 cups of berries processed with a 1/4 cup each of water and sugar, rather than the number of servings or size of a serving? 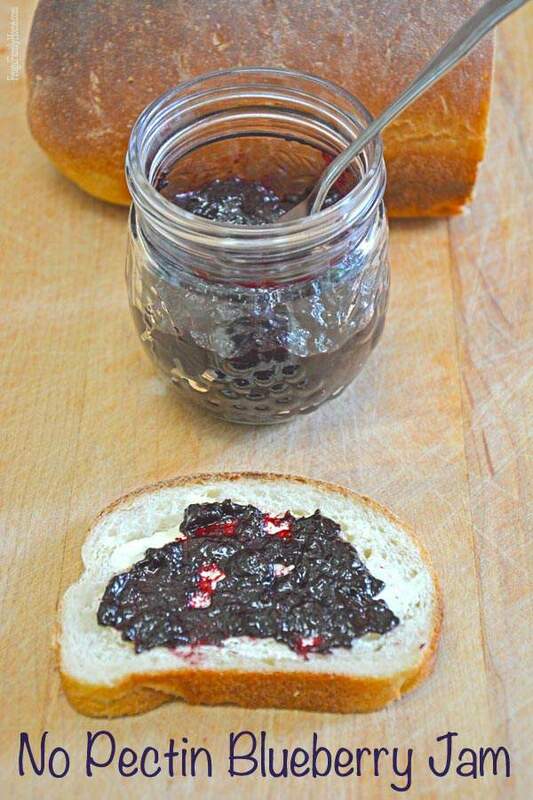 Not that some of us would mind eating four ounces of this yummy-sounding blueberry jam, especially on homemade bread. You assumed correctly, the recipe makes about 4 ounces. I hope you enjoy it, it is really good. 3 Ingredient Jam – stop the madness!!! Have you ever made this recipe with other fruits? How long does this jam usually last? Brittany, At our house it never lasts long since we eat it up pretty fast. But I would say, it should last around 2 weeks in the refrigerator.